This Sunday gospel narrative tells us about Jesus traveling through Samaria; Jesus and His disciples arrive at the Well of Jacob. As they did not carry food with them, the disciples go to the nearby town to purchase food. It was about noon and the hottest time of the day. 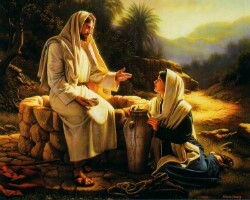 Jesus tired from his journey, sat down there on the well, (I love the picture above of Jesus "sitting down on" the well). I remember when I was training to become a chaplain in a hospital, we were instructed to always, when possible to pull up a chair and "sit down." Because it would be better to be at their level and not standing looking down on them. As the encounter continues, Jesus lets the woman know that He knows all about her, about her past and her present. And it is not that He does not care about all of that—He does care—but He cares in an unexpected way; He offers her healing and forgiveness through the grace of living water so that she may be sanctified and never thirst again. This passage is filled with imagery and meaning important to our relationship to the Lord and our daily walk with Him. It is the story of conversion, the woman’s and ours; one that takes place not all at once, but in stages and progresses over a lifetime, even if it begins in dramatic fashion. One of my childhood moments of disobedience (I went against my mother's wishes) was when I was pushed into the deep end of a pool and since I did not know how to swim I almost drowned. But from that experience I have become acutely aware of the fleetingness of human life. As I have continued my journey with Jesus, I have been blessed to experience the difference between the living water that He offers me and ordinary water. Eventually He reveals that He is the Living Water that will be for us a “spring of water welling up to eternal life.” He is the answer to every prayer. And on realizing this, she cannot wait to go and spread the good news, leaving behind her cares and even the water jug she brought with her to collect water. That’s what we do when we receive great news. We share our joy with others. She even went to share hers with the very people she was trying to avoid by coming to the well at noon. Do we want to know such joy? Do we want to receive from Jesus the living water that never runs dry? As a Samaritan and as a woman with many husbands and an outcast, she had every reason the world gives to ignore Jesus and remain as she was. But she didn’t. And neither should we. Jesus knows where we are and what we feel. He knows all our triumphs and failures. He knows our sins. He made us for Himself and He wants to purify us and give us every good thing, drawing us ever closer to Himself. But He will never force the matter, only invite us, gently and lovingly.